Format: Television show, Audio and Book. Time of Origin: Unconfirmed, but definitely some time in the future. Appearances: "World Game", "State of Decay", "Goth Opera", "Project: Twilight", "Project: Lazarus", "Twilight's End", "Blood Harvest", "The Eight Doctors" and "Vampire Science". Doctors: Second Doctor, Fourth Doctor, Fifth Doctor, Sixth Doctor, Seventh Doctor and Eighth Doctor. Companions: Serena, K9, 2nd Romana, Adric, Tegan Jovanka, Nyssa, Evelyn Smythe, Ace, Bernice Summerfield and Samantha Jones. History: For those who don’t know about vampires, which may not be many, here is their story. In Earth legend, vampires are undead beings, who become that way when bitten by another vampire. They require constant blood - drinking to stay alive, can only be directly killed by a wooden stake through the heart, cannot approach anyone armed with a crucifix or garlic, are burnt up in bright sunlight, dissolve like dust when hit by water, and are constant forms of entertainment in the TV shows Buffy the Vampire Slayer and Angel. The Doctor’s first encounter with vampires took place in his second incarnation, when he was captured by the Time Lords ("The War Games") and was forced to perform various missions for them that they wanted to officially distance themselves from in exchange for a commuted sentence. On his first mission for them ("World Game"), The Doctor - accompanied by Time Lady Serenadellatrova - was investigating The Players’ attempts to alter the outcome of the Napoleonic wars, little knowing that a Time Lord was working with the Players at the same time. Attempting to stop The Doctor from interfering with the Players’ actions, their Time Lord ally used the Timescoop - forbidden technology that took a subject from one location in time and space and moved them to another - to send a vampire from the Death Zone on Gallifrey after The Doctor, but due to him having recently eaten garlic bread at a party, The Doctor was able to drive the vampire back long enough to stake it with a convenient branch. Rassilon’s proclamation about the Great Vampire was eventually fulfilled when the Fourth Doctor, the Second Romana, and K9 passed through a CVE - A Charged Vacuum Emboitment - into E-Space, a Universe not unlike our own N-Space, but smaller, and with negative instead of positive co-ordinates. Following a battle on the planet Alzarius, The Doctor, Romana and K9 departed, unaware that a young Alzarian boy called Adric had stowed away on the TARDIS. At the next planet in E-Space they arrived on, The Doctor and Romana discovered that the Three Who Rule- King Zargo, Queen Camilla and their High Priest, Aukon, were the followers of the Great Vampire, who had escaped onto their ship, the Hydrax, made them vampires, and taken them through to E-Space, where he was slowly restored to full health by their capturing of the villagers they ruled and feeding them to him as part of a yearly ritual known as ‘the Gathering’. When The Doctor attempted to investigate the ship, although he discovered the Lords’ true nature and managed to escape, Aukon captured Adric and Romana, intending for Adric to become a new vampire and Romana to be used as a sacrifice to herald the awakening and restoration of the Great Vampire. Fortunately, The Doctor and K9 were able to develop a strategy, especially since the Time Lords had stored information on vampires in the databanks of every single Type Forty TARDIS - The Doctor's TARDIS. While K9 led an attack by the rebels on the castle, The Doctor used one of the Hydrax's scout ships to destroy the Great Vampire by staking it through the heart, and thus destroying the Three Who Rule, who had only been sustained by the Great Vampire after all their years. These, however, weren't the only vampires on the planet, as The Doctor discovered during his time on the planet, resulting in a rather interesting encounter involving both his Fourth and Eighth incarnations. Following "State of Decay", the Fourth Doctor, Romana, Adric and K9 stayed around for a brief while to ensure things went well, but in the process The Doctor and Romana were tricked into going to the House of Zarn, where Zarn, another vampire, attempted to make The Doctor and Romana the new King and Queen. However, the vampires here for some reason took longer to change a subject than the others encountered - vampirism for this type of vampires taking the form of forced mutation after feeding on them over a prolonged period, the success of the process varying depending on the strength of spirit of the subject - so although The Doctor was captured, Romana managed to escape and would have more time to try to warn the villagers. Thankfully, since she probably didn't have much time anyway, Romana met up with the amnesiac Eighth Doctor, currently visiting his past selves to regain his lost memories after falling victim to a trap set by The Master ("The Eight Doctors"). The Eighth Doctor and Romana saved the Fourth Doctor from Zarn's house, and the rebels, who'd discovered their absence, bought the Eighth Doctor and Romana time to get to the Eighth Doctor's TARDIS and take the Fourth Doctor to the rebel's base, where the Eighth Doctor saved the Fourth Doctor by giving him a blood transfusion, since the vampires had overdone it when drinking from the Fourth Doctor. Later on, on Gallifrey, a Time Lady named Ruath, who The Doctor had planned to leave Gallifrey with, became convinced that the Time Lords were destined to become a vampiric race, due to apparent evidence that Rassilon became a vampire near the end of his life. She managed to force Romana, now back on Gallifrey after being taken there by the Seventh Doctor, to take her to the Timescoop, and then attempted to give the vampires the blood of a Doctor. She rejected both the Thirteenth Doctor and the Seventh Doctor, both being too devious for her to easily trick, and decided on the more vulnerable Fifth Doctor. 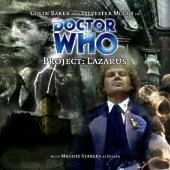 She sent a baby vampire to attack The Doctor while his companion Tegan Jovanka tried to recover from her possession by the Mara, ("Snakedance") but the vampire, known simply as the Child, made a mistake and attacked Nyssa instead. Due to her being unable to use The Doctor’s blood for her purpose, Ruath fed her blood to the vampire lord Yarven, stuck on Earth some while ago and then buried alive for fifty years, and was then made Yarven's vampire consort. While The Doctor and Tegan investigated reports of vampire attacks in Manchester, Nyssa was captured by Yarven, but thankfully only fed on animal's blood - if she drank human blood, she would become a vampire for good. Some time after that, the Sixth Doctor and his companion Evelyn Smythe were eating a meal from a Chinese takeaway called the Slow Boat when they stumbled accross a mass of murdered - and eaten - animals. As The Doctor and Evelyn were confronted with further deaths in the alleyway as they witnessed a man get shot with a crossbow and the blood subsequently boiling around the wound, it wasn't long before their investigation lead them to some strange goings on at a nearby casino called "The Dusk", which they investigated with the aid of a young waitress called Cassie, who was being forced to act as a spy for the sake of her mother and young son. 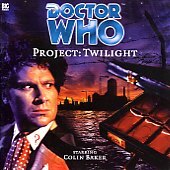 Meeting the mysterious Nimrod, The Doctor realized he was dealing with vampires again, seeking to resurrect an ancient government project from the First World War called Project: Twilight, a project that had sought to create a superior soldier class for the war using genetic engineering. The research team had somehow come into possession of vampire DNA - Nimrod was the doctor originally in charge of the experiments who transformed himself after his test subjects nearly killed him, subsequently being cybernetically augmented as he hunted his own creations - but although they won The Doctor’s support by claiming that they sought a cure for their condition, their true plan was to allow them to turn others into vampires using the nanobots that transformed them. Fortunately The Doctor managed to escape with the aid of Nimrod, subsequently destroying Amelia - the vampire responsible for the work on the nanobots - by dragging her into the river, apparently drowning her. The Doctor and Evelyn departed, but were unable at the time to help Cassie - who had been turned by Nimrod, although she still wasn't a killer at heart - intead leaving her in a Norwegian forest in order to ensure she wasn't a danger to anyone else. What was more, Nimrod had survived, and, although unable to find Amelia's body, he knew that Cassie survived, and his superiors ordered him to bring her back... alive. A few months after the events of "Project: Twilight", The Doctor and Evelyn returned to track down Cassie, The Doctor having developed a cure for the Twilight virus. Unfortunately, the TARDIS forced them to dematerialise several years after they'd left Cassie in the forest, rather than the mere seconds The Doctor was aiming for, and discovered that Cassie had been forced to flee Nimrod and the Forge for decades... or so it seemed. In reality, Cassie, now known as 'Artemis', had been working for the Forge for ages, having found a real sense of home and family there; indeed, the Forge as a whole seemed better than before, now dedicated to studying alien technology for the benefit of humanity rather than the genetic experiments it had performed before. However, Nimrod wanted The Doctor there for a simple reason; to take a blood sample and force The Doctor to regenerate so Nimrod could learn how to harness the ability for himself. Fortunately, Evelyn managed to reveal the truth to Cassie - Nimrod had brainwashed her into joining the Forge to act as bait for The Doctor - and, in the end, Cassie not only saved The Doctor from the Forge's experiments, but also sacrificed herself to give The Doctor and Evelyn time to escape (Her son, Thomas Hector ‘Hex’ Schofield, would go on to travel with the Seventh Doctor for a time, although The Doctor’s initial meeting with Hex was nothing but a coincidence). When The Doctor finally discovered how Yarven got to Earth, The Doctor was in his seventh incarnation, and had sent his companion Bernice Summerfield off to E-Space to investigate recent uprisings between the peasants and the human Lords on the vampire planet, while, based on an anonymous tip, The Doctor and Ace opened up an illegal bar called 'Doc's Place' during Prohibition to create a neutral area for the gang lords to meet, The Doctor seeking the evil Agonal, who intervened throughout history to make bad situations even worse. While trying to avert the gang war that Agonal sought to trigger, the two of them befriended Private Eye Tom Dekker (Who would meet the Sixth Doctor in his future and The Doctor’s past during the events of "Players", although Dekker was never aware of the Sixth’s connection to the Seventh), initially sent by Al Capone to investigate The Doctor. Trying to calm the riots on the vampire planet, Benny and Romana discovered that Agonal had managed to resurrect Zargo, Camilla, and Aukon while stirring up the conflict between the locals, and would soon do the same to the Great Vampire. As Agonal’s manipulations triggered the St Valentine’s Day Massacre in Chicago, The Doctor, Ace, and Dekker were forced to retreat to the TARDIS, pursuing Agonal to E-Space. Just as Agonal prepared to fully resurrect the Great Vampire, Dekker managed to kill Zargo, Camilla and Aukon with bullets straight to the heart, while The Doctor blew up the Hydrax and exposed the newly -resurrected Great Vampire to sunlight, killing it again as well. Although Agonal was Time-Scooped away before The Doctor could deal with him, The Doctor tracked Agonal to Gallifrey, where he discovered that Agonal had been ‘captured’ by the Committee of Three - a security council made up of three Time Lords whose lives had been ruined thanks to The Doctor - who had used The Doctor to find Agonal with the intention of pitting him against Rassilon to save Borusa. Unfortunately for the Committee, Borusa had seen the error of his ways during his imprisonment, working with The Doctor, Romana and Rassilon to crush Agonal and leaving the Three to be captured. Romana remained on Gallifrey, and The Doctor, Ace and Benny took Dekker back to Chicago, where Dekker took over Doc's Place (A vampire Lord from E-Space managed to escape to Earth by hiding in Benny’s archaeological equipment, but The Doctor was unconcerned about that due to his knowledge of Yarven’s fate). The Doctor’s history with the Forge came to an end when the Seventh Doctor materialised inside the Forge’s new headquarters ("Twilight's End"), The Doctor being forced to flee the security forces sent to kill him by retreating deeper into the building as doors lured him in that direction. Arriving at the heart of the Forge, The Doctor discovered the elaborate cyborg computer system known as the Oracle, and was horrified to recognise it as the now-barely-alive Nimrod, permanently wired into the machinery before him. With no other way to help Nimrod, The Doctor left a sample of the Twilight cure and departed, leaving it up to Nimrod whether or not he would use it to end his nightmarish existence. During the events of "Zagreus", when the Eighth Doctor was contaminated by the forces of anti-time, the TARDIS - currently being manipulated by Rassilon after it was also contaminated by anti-time - generated holographic simulations for The Doctor’s current companion Charley Pollard as it sought information about the race known as the Divergents, Rassilon seeking to use the anti-time-contaminated Doctor as an assassin against the Divergents and the TARDIS trying to decide whether or not to help him. One of these simulations was set in Gallifrey’s past, where the vampire Lord Tepesh tricked members of the Sisterhood of Karn ("The Brain of Morbius") to help him gain access to Rassilon’s workshop in an attempt to learn his secrets, culminating in a confrontation with Charley as she assumed Rassilon’s role in the simulation before the lab was destroyed as a result of Tepesh’s attempts to access forbidden information (During this confrontation Tepesh claimed that the vampires had originally been a peaceful race feeding on genetically-modified animals before Rassilon found them and concluded that they were too different to be allowed to live, but Tepesh’s ‘class’ of vampire may be different to the ones created by the Great Vampire). The illusionary Tepesh - the physical double of the Sixth Doctor, granting him access to at least some of The Doctor’s knowledge - later aided Charley in convincing The Doctor to fight Zagreus’s influence after Charley was banished to the Matrix along with Tepesh and two other holograms based on The Doctor’s fifth and seventh incarnations, these manifestations of his past giving The Doctor the strength to banish Rassilon to the realm of anti-time and be subsequently cured of the Zagreus persona. As well as the above encounters, the Seventh Doctor and the Tenth Doctor have confronted vampire-like entities known as Haemovores and Plasmavores respectively, each of them resembling vampires while still being clearly identified as a separate species. The Haemovores ("The Curse of Fenric") were agents of the powerful evil known as Fenric, possessing vampire-like abilities but lacking their vulnerability to sunlight, although strong faith - such as The Doctor’s faith in his past companions, or a Russian soldier’s belief in the Russian Revolution - could hold them back and even appeared to cause them pain. The Plasmavores ("Smith and Jones") were an alien race, apparently capable of shape-shifting, who could ‘trick’ alien sensors to register them as human by drinking human blood; the Tenth Doctor and his new companion Martha Jones were able to expose a Plasmavore hiding on Earth by tricking her into drinking The Doctor’s blood, causing her to register as alien to the sensors of The Judoon policemen tracking her. The Eleventh Doctor encountered what appeared to be vampires when he visited Venice in 1580 with his companions Amy Pond and Rory Williams, but he soon discovered that they were actually a fish-like alien race called The Saturnynians, who had escaped their dying world when cracks in time and space appeared around their planet and forced them to escape. Although they shared many similarities to vampires, these were all merely coincidental; their human appearance was caused by a perception filter that didn’t show their reflections in mirrors due to the brain’s inability to process what the filter reflected and causing them to see nothing, their sharp teeth were exposed when they attacked as the brain’s fear in the face of danger caused them to break through the filter and see danger, and their evolution to exist underwater had rendered them vulnerable to sunlight, with The Doctor holding them back with an ultraviolet lamp and Amy destroying one by focusing sunlight on one of them with a pocket mirror. The Saturnynians ‘mother’ was attempting to transform human girls into mates for her male offspring - the only offspring to survive the journey from their world to Earth - by gradually draining the moisture from the girls and replacing it with their own blood, but this plan was defeated when The Doctor refused to allow them to sink Venice to make it a suitable environment for them, the Saturnynians mother committing suicide after The Doctor defeated her plan rather than listen to his offer to help them another way. Whether true vampires will ever appear in the series remains to be seen.